One of the most recognized and respected names in ammunition, Winchester has been shaping the world of shooting for more than 150 years. Known for its long history of quality, pride, and innovation, Winchester brings these same qualities to their Ranger series loads. Developed specifically to meet the needs of law enforcement officers, Winchester Ranger is some of the finest self-defense ammo available today. 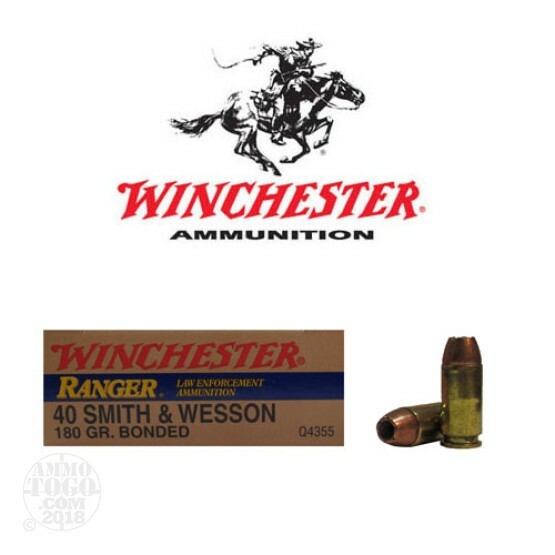 Perfect for stocking up, this package contains 500 rounds of Winchester Ranger .40 Smith & Wesson ammunition. Each round is loaded with a 180 grain bonded hollow point projectile. Manufactured using a unique bonding process that eliminates the limitations of the traditional copper-plated projectile, these loads produce maximum weight retention and excellent penetration, even through tough barriers like steel and auto glass. Working in tandem with the hollow point cavity, the bonded jacket helps produce controlled, hard-hitting expansion. Carving a devastating wound channel, these loads produce dependable and effective threat-stopping terminal performance. This factory fresh ammunition is non-corrosive, boxer primed, and features high-quality reloadable brass casings. Leaving the muzzle at a velocity of 985 feet per second, these rounds produce 388 foot pounds of muzzle energy.